In its latest livestream from the studio, developer Playground Games revealed the full suite of new content and features included in the Series 5 Update for Forza Horizon 4. 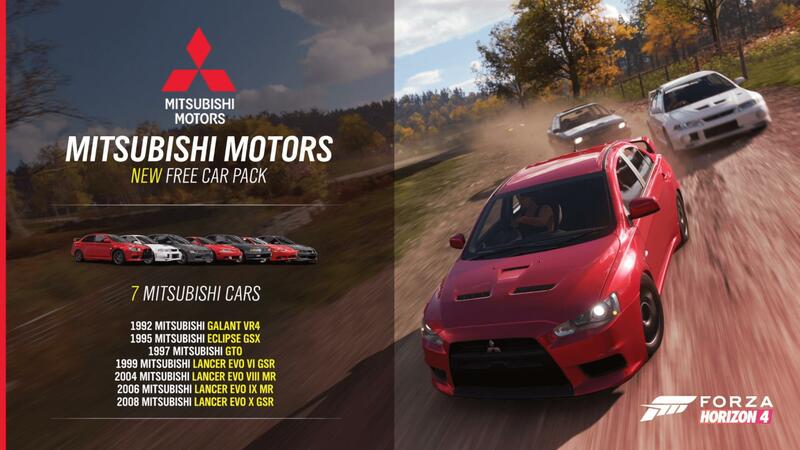 In addition to the ‘Free-for-All Adventure’ mode as previously announced, the team also had two additional surprises to share with viewers – including the return of Mitsubishi to the Forza franchise, as well as the introduction of the long-awaited Taxi Business into Forza Horizon 4. Meanwhile, Isha’s Taxis is the official name of the new Horizon Story coming to the game, but it’ll cost you 100,000 credits to fund the business. You’ll earn a pay cheque each day based on how many stars you’ve accumulated from the missions associated to this business. The overall goal behind this initative is to run the world’s fastest taxi business, which is the pitch Joel gives to you, who is friends with Isha. The characters you’ll encounter in these missions have a cool and quirky personality to them, which is expressed as you take them to their destinations. Initially, you’ll be driving a stock Austin FX4 London cab, but Isha feels that to achieve the goal of the fastest taxi, you’ll need to upgrade it. Eventually, the taxi becomes fully tricked-out and upgraded with a Ferrari F50 GT engine and an accompanying bodykit, featuring its own custom livery design to represent the business. 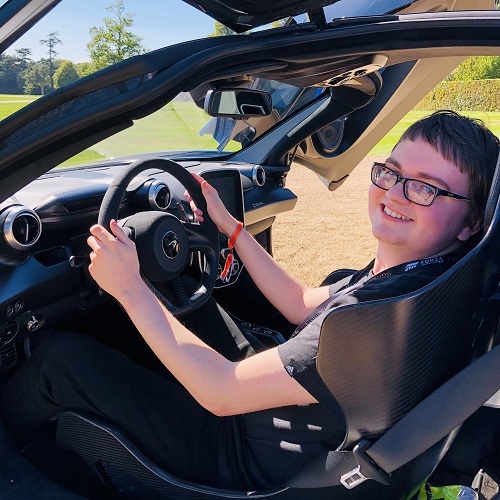 Whilst most runs will see you driving around the British countryside and Edinburgh City, you’ll also be heading off-road as one of the taxis has been kitted out as a dedicated rally monster with rally tires and a rally engine, primed for off-road driving. Across all 10 of the missions, you’ll drive to the location of the fare, pick them up and drop them off at their designated spot within the given time-frame. You’ll see the fare walk towards your car in a cinematic as you pick them up, with narratives associated to each of the characters. One of the fares includes a critical London taxi driver who acts cocky and tries to intimidate you over your driving ability and taxi business. 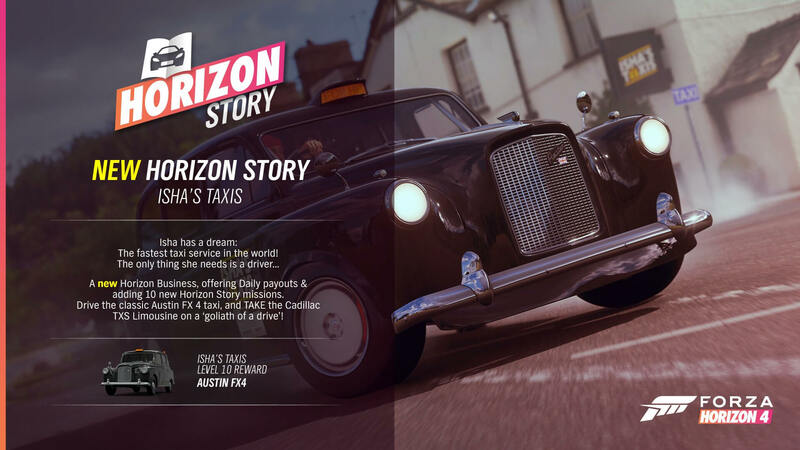 The final component of this Horizon Story also sees you behind-the-wheel of the Cadillac TXS Limousine as you take a lengthy drive through the British countryside! Of course, you’ll also be able to earn up to 3 stars across all the missions featured in Isha’s Taxis business, and some will challenge you to complete specific skills before reaching the designated parking spot. Once you complete all the missions, you’ll also unlock the Austin FX4 Taxi in your Forza Horizon 4 garage, which was previously exclusive to Wheelspins and the Auction House. Playground Games has committed to adding more Horizon Stories in the future, with the Series 6 Update due next month introducing a small improvement to show the full event objectives whilst playing Horizon Stories to make the experience more streamlined than before. Other changes in the Series 5 Update include the introduction of the ‘Free-For-All Adventure’ mode, which is available in both Ranked and Unranked variants. This solo-inspired mode sees players competing against each other individually instead of being grouped as teams, and can be located under the renamed ‘Online Adventure’ tab. 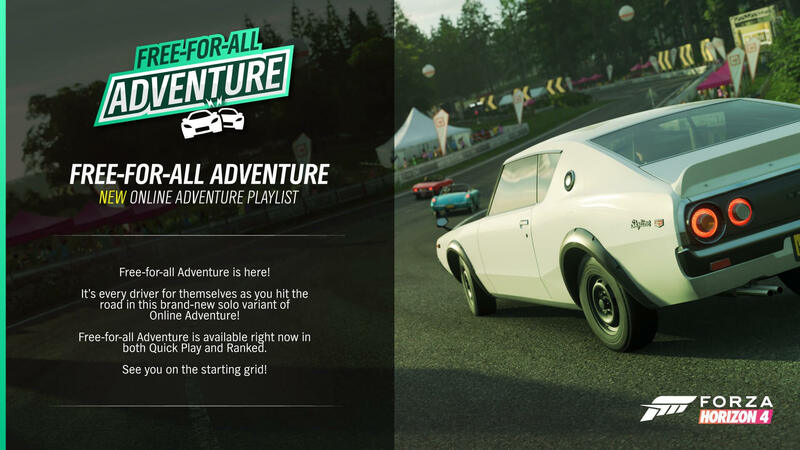 This new free-for-all experience replaces the ‘Anything Goes’ mode from Team Adventure, which combined Racing and Playground Games into one playlist. In addition, Playground Games has also introduced ‘Racing Series,’ ‘Creator’ and ‘Title’ filters to Event Blueprint searching – allowing you to find custom routes developed by the community easier than ever before. There’s also now the ability to view eligible cars for a Trial or Seasonal Championship, whist a fix has been applied to an issue that saw Drivatar names duplicated in events. Meanwhile, the ‘Carlton’ and ‘Floss’ character emotes have been removed for unspecified reasons. You can find the full breakdown of fixes, tweaks and improvements outlined in the official patch notes on the Forza Motorsport website. Finally, the Series 5 Update introduces modern race suits for character customization, which will be available to unlock from the Forzathon Shop and Seasonal Championships. Be on the lookout for these over the next four weeks with each of the seasonal changes throughout Series 5. 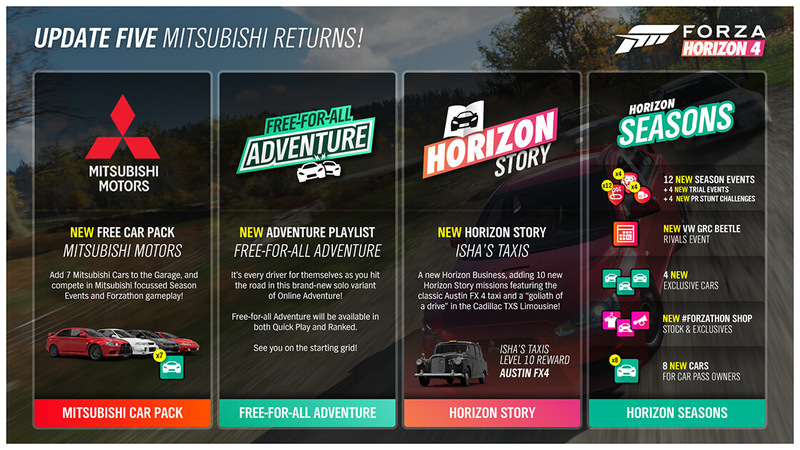 You’ll be able to experience Mitsubishi, Isha’s Taxis and Free-for-All Adventure with all the tweaks and improvements featured in the Series 5 Update once it rolls out for Forza Horizon 4 on Xbox One and Windows 10 PC this Tuesday, January 15th from 6pm GMT (10am PST, 1pm EST).